Just a fishing village? Not anymore! Well, you can definitely still toss a pole in the water and catch your dinner, but if lounging on the beach or spotting local wildlife is more your style, Port Douglas is just the ticket. With boutique shops, gourmet restaurants, and fine wines too, Port Douglas has blossomed into a sophisticated, relaxing alternative to Cairns. Like that time you turned your boring old lawn into an elegant European-style garden. Well, you had a dream about doing that, anyway. Hey, who needs a garden when you have the palm-fringed beaches of Port Douglas? Pack your snorkel and scuba gear, because you’ll be just a few kilometres from the underwater flora and fauna of the Great Barrier Reef. Bring a waterproof camera, too, and maybe you’ll get to snap some shots of the rich and famous when they tie up their 12-bedroom mega-yachts at Reef Marina. 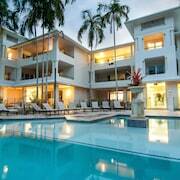 Hey, our hotels in Port Douglas are almost as cool. How do I get to Port Douglas from the airport? There are no direct flights to Port Douglas, but Cairns Airport (CNS) is just 68km away. 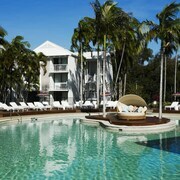 Don’t worry—our Port Douglas holiday packages will set you up right. Then you can wave to the piles of tourists as you drive past them in a taxi or your own car rental (booked right here on Wotif, of course). 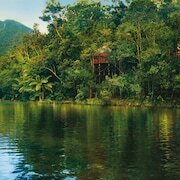 You’re on your way to accommodation in Port Douglas off the beaten path. You trailblazer, you! 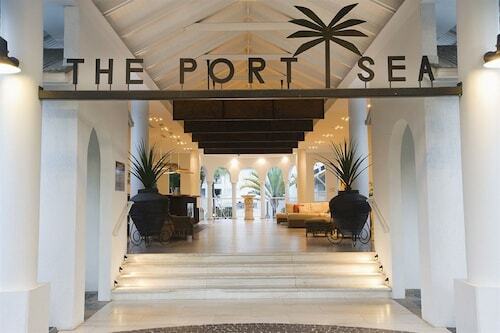 What kind of hotels are in Port Douglas? 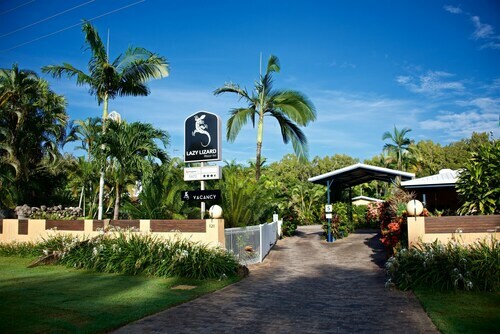 Where should I stay if I’m visiting Port Douglas? Port Douglas is a reef-front resort town, so you know there will be plenty of comfortable places to hang your snorkel. 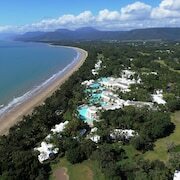 You can find dozens of Port Douglas hotels in the town’s two main areas right here on Wotif. The north city centre sits on the peninsula and has lots of restaurants, shops, the marina, and views of Morey Reef. 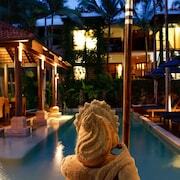 Further south are larger, highway-close resorts with seemingly-endless stretches of beach and the Alexandra reefs. Picking one will be harder than trying to choose between ketchup and catsup. What are some things to do in Port Douglas? Let’s see: Rainforest? Check. Coral Reefs? Check. Gorgeous beaches? Super-check. Looks like you’ll have a busy holiday. We know. Resort life is tough. With so much to see and do, you’ll be glad for our Port Douglas hotel deals—and these ideas on how to spend your holiday. Life’s a beach in Port Douglas—especially when you book places to stay in Port Douglas right here on Wotif. With so many great deals, you won’t have to put on your sunnies to see your holiday with rose-coloured glasses. And with the money you save you could start planning next year’s getaway too. Whitsundays accommodation,anyone? How Much is a Hotel Room in Port Douglas? 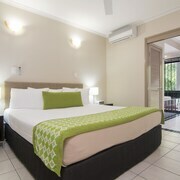 Hotels in Port Douglas start at AU$85 per night. Prices and availability subject to change. Additional terms may apply.